Eggplant lovers enjoy this vegetable as a side to any dish. 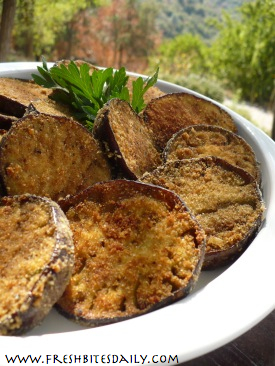 Baked, rather than fried, the eggplant absorbs less oil and seems a bit more meaty as a result. We freeze these crusty rounds to use as the foundation of a couple of main dishes — at least we freeze what does not get gobbled up as a side dish. Wash and dry the eggplant. Remove both ends and slice the eggplant into 1/2 inch discs and place in a large container. Mix the oil, garlic and salt. Drizzle over the eggplant and toss quickly. Get the oil as well distributed as possible. Lightly oil a cookie sheet with sides. Mix the bread crumbs and grated cheese on a large plate. Press an eggplant disc into the crumb mixture. Press on both sides. If the crumbs seem thin, press again. Place the coated disc on the oiled baking sheet. Repeat with all the discs. Sprinkle a little extra crumbs on the tops of the eggplant before popping them into the oven. Bake for about 15 minutes and then carefully flip them over. Bake for about another 15 minutes. Cooking time will vary based on the thickness of your slices and your altitude. Test the eggplant with the tip of a sharp knife. There should be no resistance if the eggplant is completely cooked. 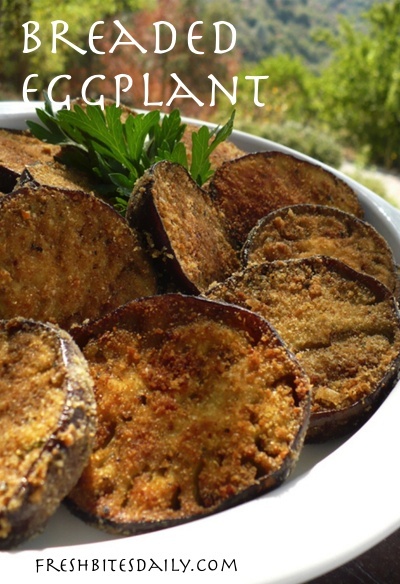 1 Comment on "Breaded eggplant, baked in the oven for a healthier take on the classic"
This is so different from the way i cook eggplant usually, thank you for this original recipe.